Unless you’ve been living under a rock for the last week or so, you’ll have seen a DeLorean whizzing across your TV screen in ad breaks. Now me, I rewound the TV when I first saw it, and thanks to the fact that it’s for Phones 4u, I have a great reason to talk about it here. It’s the biggest advertising campaign ever for the retailer, and they’ve decided to address one of the main concerns that customers have – how they’ll use their phone in the future. With two year contracts now the norm, customers want future-proof handsets that’ll still keep up with their lives in years to come. Not only that, but the people who created the ad (an outfit called adam+eveDDB) have helped to recreate a brilliant re-make of the original Back To The Future movie in the process. 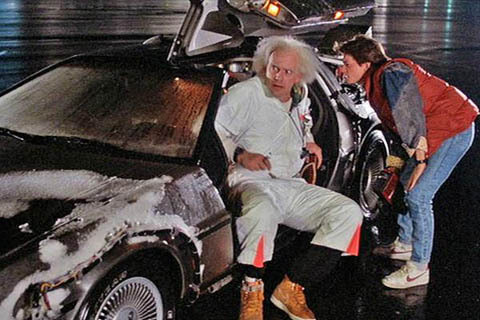 The iconic DeLorean car, which features in all three of the original movies, was originally chosen by Dr. Emmett Brown because..
Time travel, as any Back To The Future movie buff will tell you, is made possible thanks to a flux capacitor. Then, as you’ll see in both the movie and the TV advert, the car then speeds toward 88mph to kick off the time “jump”. In the commercial, a customer is transported into the future to see how her handset is still continuing to help her out, even after she’s owned it for 2 years. Now let’s admit it. We all hate that moment when we see a friend or colleague with a newer phone and we’re “locked” into a contract. However, despite the rapid change in mobile technology, the ad highlights the Phones 4u staff and their ability to figure out what your needs are before helping to recommend a phone.